Fair question. As I mentioned, the main difference between new Pro version and the already familiar Adguard for iOS is the ability to filter traffic of other apps and browsers. This is possible thanks to Adguard DNS incorporated into Pro version. 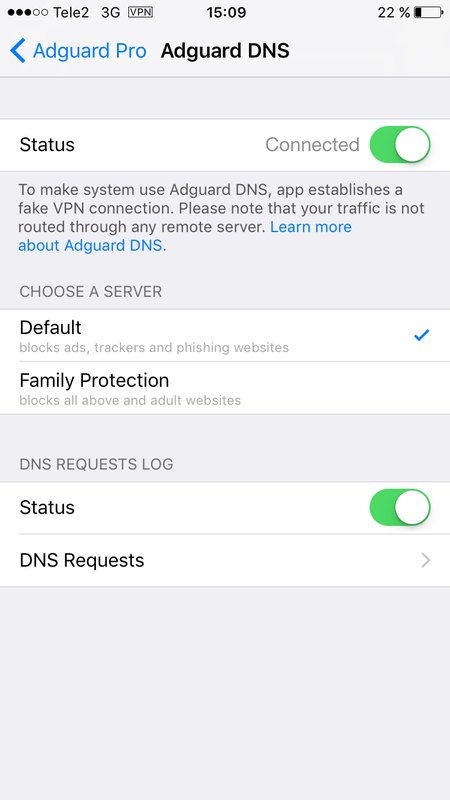 If you are interested in how exactly it works, you can dig up the older blog article about Adguard DNS. There's, of course, more to Adguard DNS. As you can see from the screenshot below, it has two separate modes. Default mode is what it says it is: a basic mode to block ads, trackers, phishing websites etc. Family protection does more than that. It does all that 'Default' mode can do, but also blocks all websites with adult content. Suits perfectly if you are, for example, installing Adguard Pro on your child's device. If you are a type of person who always prefers a bit of fine tuning to default setup, we have a handy tool for you. DNS requests log will help you monitor all requests and easily whitelist any website you'd like to support. 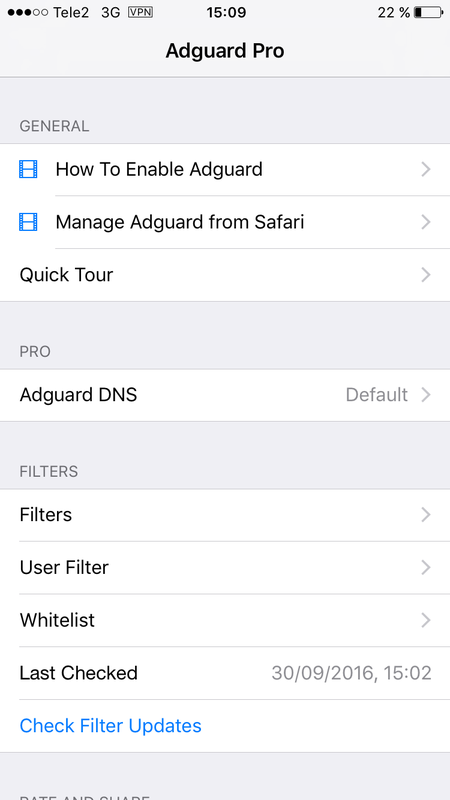 It should come without saying, but I will remind anyway: of course, Pro version can still do everything regular Adguard for iOS can. That is: blocking ads, trackers and malware in Safari, offering a wide choice of filters - both Adguard own ones and most popular external filters like EasyList - all of the above is complemented by the speed acceleration. When you have less stuff to load on a page, it will load faster! As you understand, you don't call a version 'PRO' for nothing :) As well as in the Android version, ad blocking in apps is a premium feature that is not free. To mark our first official release we have temporarily reduced the price: $0.99. We can't tell you for sure when the price will be increased, so for now we would recommend to purchase Adguard while the special offer is valid. So, upgrade to Pro, the new Adguard is already waiting for you in App Store! Important: mobile or premium Adguard licenses are not valid for iOS Pro, this app can be purchased and activated only in the App Store.